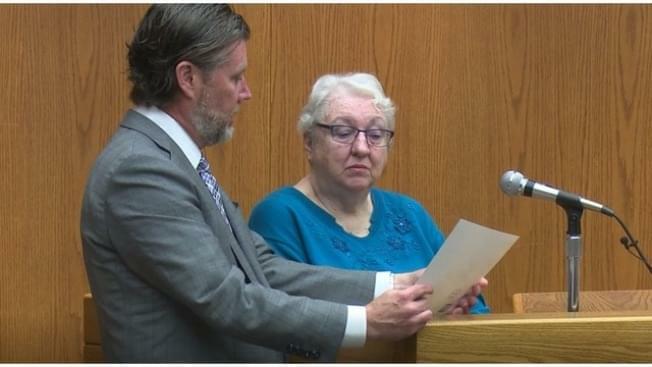 BLOOMINGTON – The Kirk Zimmerman murder trial kicked off its second week with testimonies from Pam Zimmerman’s former secretary. Pam, Kirk’s ex-wife, was found dead in her Bloomington office in November 2014 by her former secretary Ina Hess and her good friend, Julie Koh. In May 2016, Hess said Pamela had an appointment with a man named Eldon Whitlow at 4:30 p.m., but on Monday, she said his appointment was at 4 p.m.
“I just now remembered that his appointment was at 4 p.m.,” said Hess. If the appointment was at 4:30 p.m. and not 4 p.m., this would mess with the prosecutors’ timeline and would better align with Zimmerman’s. And if it was actually at 4 p.m., it would better match the plaintiffs’. Hess said she met with the prosecution since May 2016, but claims they never spoke of those details. Hess said only her and Pam had only had keys to the office, but in a transcript from a previous interview with Bloomington police, she said Pam and her interns had keys. BPD had spoken to Whitlow and found out he owned a 9mm firearm, the exact make of the gun that was used to kill Pamela. However, officials tested the weapon and determined that it wasn’t the gun used. Pam had been shot multiple times, including once in the head.